Overheating kids bedroom gets new lease of life. 01 Jun Overheating kids bedroom gets new lease of life. We were recently approached on how to cool an attic bedroom which our client had recently renovated for their young daughter. As it sat at the top of the house and with South facing Velux windows the temperatures in summer made the room pretty unbearable. It was a small room in design with an unusual shape, low ceiling and weird angles. We came up with the solution to install a wall mounted A/C unit in the room, to be honest it was the only solution. This would provide the cooling so desperately needed, but would also provide heating come the winter, as there wasn’t an adequate wall suitable for a radiator. As this room was to be used by a young girl the house owners quite rightly didn’t want an ugly box hanging in their daughter’s room. We came up with the perfect solution to this problem by hanging a unit disguised as a picture. 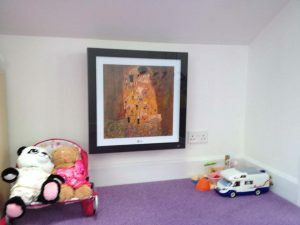 The overall effect in the girl’s room was stunning, and both Mum & Dad and their little girl loved the overall effect. On visiting the room after the installation you would never have guessed the picture hanging on the wall was in fact providing fantastic cooling & heating when required. Having since spoken with the home owners they have admitted to this room being in particular demand, especially in the height of summer, as the cooling provided is a welcome relief. Not sure the daughter enjoys sharing her room but always good to have happy, satisfied customers. 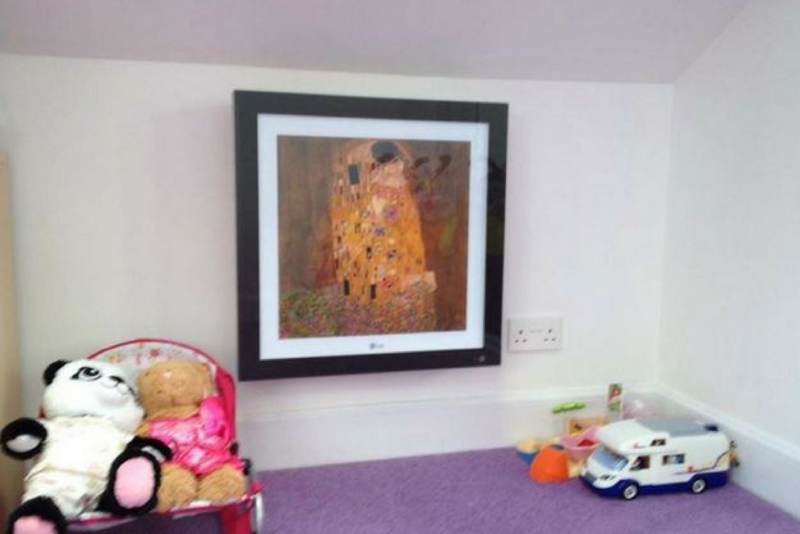 The added benefit in using this picture effect LG air conditioning unit is that as the child grows and her room gets redecorated, this picture will not date. It will always be a stunning feature in the room, whilst doubling up as a heat provider in the winter and a welcome relief to the muggy, sticky summer temperatures, especially up in the attic. The great and versatile thing about this kind of unit is, as the child grows or tastes change, the picture fronts can be changed. There are a variety of different pictures to suit any room type or stick your own photo or drawing in the front of the unit in a few seconds. The unit we decided upon was an Lg Air Conditioning Art Cool Gallery A09AW1-NF2 Wall Mounted system. Ultra-slim, uncluttered and minimalist Art Cool transforms air conditioning indoor units from being simply a means to an end to become an object of desire – even when it’s not operating, people notice it, perfectly blending in with any environment. The front fascia clips open and allows the user to put a picture in for display giving the unit the added feature of a picture frame. Totally unique to LG Art cool Gallery units. The ultra slim indoor unit is only 145mm deep. Its slimline profile and clean lines makes it one of the most efficient, effective and advanced air conditioning units.